Practice Mechanical Behaviour & Testing of Materials questions and answers for interviews, campus placements, online tests, aptitude tests, quizzes and competitive exams. This set of Mechanical Behaviour Multiple Choice Questions & Answers (MCQs) focuses on “Creep Strength”. 1. _____ occurs when metal is subjected to a constant tensile load at an elevated temperature? Explanation: Creep takes place at constant tensile load on elevated temperature. It is a time-dependent deformation. While fatigue is a failure of material caused by repeatedly applied loads. 2. Creep is a ____ dependent phenomenon. Explanation: Creep occurs at all temperatures. This deformation occurs at constant stress. It is a time-dependent phenomenon. Explanation: Creep deformation occurs due to the sliding of grain boundaries. At elevated temperatures, grain boundaries become weaker than grains. To enhance creep strength, this sliding is checked by various methods. 4. Which one of the following, is a static mechanical property? Explanation: Properties, which are measured on a constant external force, are static Mechanical properties. Creep strength is measured under constant stress. Impact strength, fatigue strength and rebound hardness are dynamic properties. 5. The ______ the melting point and the _____ the elastic modulus, the higher is creep strength. Explanation: Creep deformation is easy in lower melting point materials. With an increase in elastic modulus, creep strength of material improves. It is because deformation is difficult in high elastic modulus materials. 6. In _____ creep, atoms diffuse along grain boundaries and grains elongate in stress axis. Explanation: Coble creep is a diffusion controlled creep. It increases with increasing temperature. It is highly dependent on grain size. 7. With which factor, a magnitude of creep doesn’t increase? Explanation: With a decrease in grain size, magnitude of creep increases. It is because grain boundaries become weak at elevated temperatures and start to slide. With an increase in temperature, time and stress creep increases. 8. Crosslinking in Polymers increases creep strength. Explanation: Highly cross linked Polymers show good strength and elastic modulus. Thus these resist plastic deformations at high temperatures. Hence these show high creep resistance. 9. Which statement is correct regarding creep strength? Explanation: Cast materials show higher creep resistance. With increasing temperature, creep rate increases. Aromatic rings in Polymers increase creep resistance by cross linking. 10. Creep occurs only at high temperatures. Explanation: Creep occurs at all temperatures. Materials with low melting temperature (as lead and solder) begin to creep at room temperature. Plastics also creep at room temperature. Explanation: Nabarro-Herring creep predicts a strain rate that is a function of D-3. Grain boundary creep predicts strain rate that is a function of D-2. Here strain rate is a function of grain size, D.
Explanation: For metals, creep is noticeable at 35% of melting temperature. For ceramics this is 45% of melting temperature. Some low melting point materials (here Sn) show creep at even room temperature. Sanfoundry Global Education & Learning Series – Mechanical Behaviour & Testing of Materials. 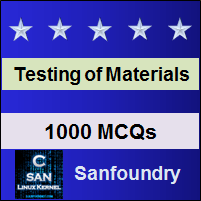 To practice all areas of Mechanical Behaviour & Testing of Materials, here is complete set of 1000+ Multiple Choice Questions and Answers.